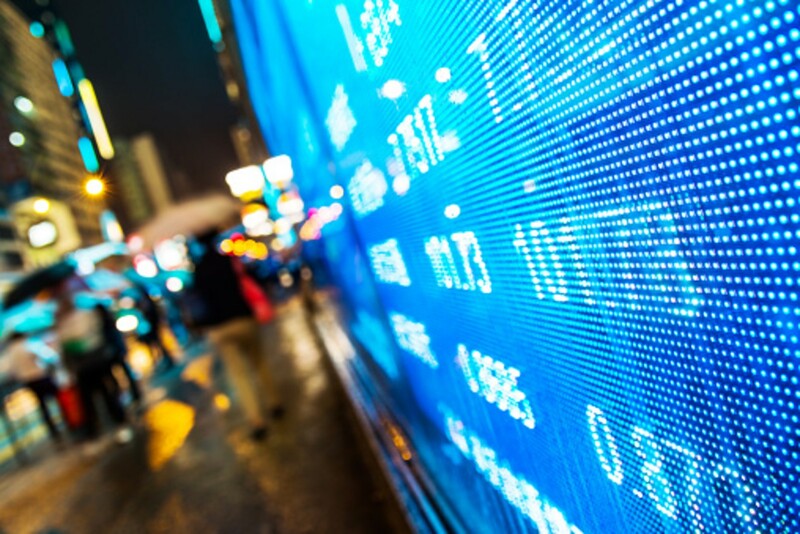 The market opens Tuesday near six-month highs, but might face some challenges including more trepidation over Brexit, a rising dollar, and disappointing Walgreens earnings. 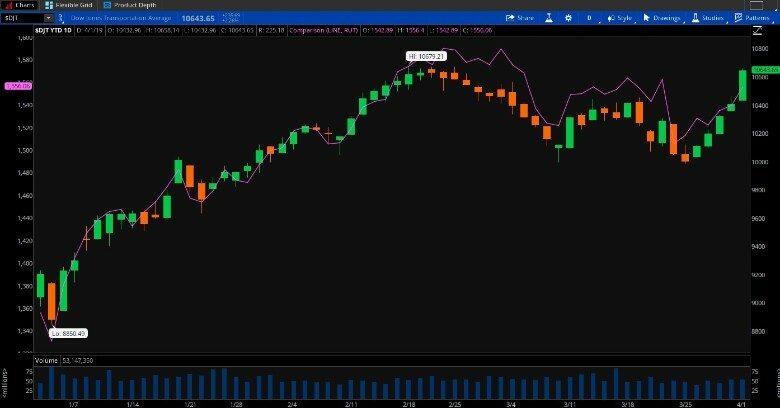 (Tuesday Market Open) How can Wall Street follow up its best day in nearly two months? That’s the question Tuesday after the S&P 500 (SPX) touched a nearly six-month high Monday amid growing enthusiasm about both the U.S. and Chinese economies. If anything stands in the way of continued gains, it might be disappointing earnings results from Dow Jones Industrial Average ($DJI) component Walgreens Boots Alliance (WBA), which missed third-party consensus earnings per share estimates and cut its 2019 outlook early Tuesday. The company cited “consumer pressures” in the U.S. and U.K. along with falling generic drug prices. Another focus today might end up being the dollar, which rallied overnight vs. the pound and other currencies amid trepidation around Brexit in Europe. A stronger dollar can sometimes act as a barrier to stock market rallies. With the dollar climbing, gold descended to three-week lows. Volatility is back on the downswing, with VIX falling under 13.5 early Tuesday after hitting highs above 17 last week. VIX is now down five of the last six sessions. Investors might want to consider keeping an eye on VIX if it falls below 13, because the last couple times it did, it bounced quickly back. The bond market is staging a slight rally early Tuesday after getting taken out to the woodshed on Monday. Financial stocks, which led the Wall Street gains yesterday, conceivably could face pressure if yields start falling again. We’ll have to wait and see. In other corporate news early Tuesday, Amazon (AMZN) is planning to cut prices at Whole Foods, The Wall Street Journal reported. That could conceivably help put pressure on some of the other grocery companies. Today is also when we get to see how some of the automakers fared in March. Durable goods orders for February fell 1.6%, which was worse than the Briefing.com consensus had expected, though some analysts appear to have expected an even lower number. Also, January orders got revised downward. This contrasts with some of the strong manufacturing data seen yesterday. Stocks started the new quarter right where they left off the old one Monday, with a sharp rally. It was one of the best Wall Street performances of the year, with all the major indices up 1% or more. Some of the rallying sectors included Financials, Industrials, Info Tech, Communication Services, Materials, and Energy, all of which are so-called “cyclical” sectors that tend to do best when investors have high hopes for the overall economy (see more below on Monday’s sector performance and what might have helped drive it). 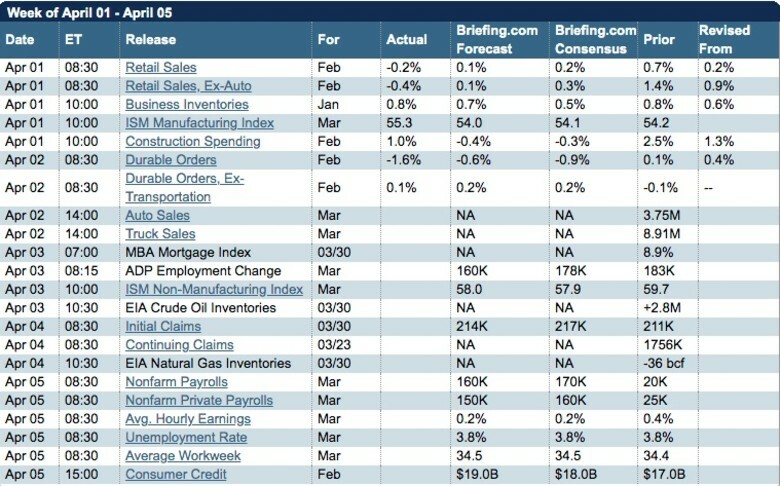 Stronger than expected construction spending data for February along with a solid U.S. manufacturing number for March might have been among factors that helped spark the rally. Retail sales for February fell 0.2%, which looked like a disappointment at the outset. However, retail sales for January got revised up to 0.7% from the previous 0.2%, so that might have wiped away some of the tears. All of this positive news, combined with a surprisingly strong China manufacturing report, put Treasuries on the defensive for the first time in a while and seemed to help ease worries after last week’s yield inversion. The 10-year yield rose to 2.5% Monday, finishing the day 11 basis points above the three-month yield and 17 basis points above the two-year yield. This action might be one thing that helped Financials on Monday, as the inversion last week had raised some profit worries for banks. Financials climbed 2.4%. The big blowout to start Q2 drove the S&P 500 Index (SPX) through what technical analysts had seen as important resistance at 2834 and 2850. The settlement just above 2867 tied a nearly six-month high. The last time the index closed above this level was on Oct. 8. The SPX’s intraday high Monday was its best showing of 2019. One thing that looked a little less positive is volume, which was low again Monday. Sometimes a big rally without heavy trading volume can get a sideways look from some investors, who might doubt the overall conviction. It could be interesting to see if volume climbs later this week, but we might just be in a light-volume period because we’re between last month’s Fed meeting and earnings season. As Briefing.com pointed out, 837 million shares changed hands at the NYSE floor on Monday, shy of the 200-day moving average of just below 913 million. The SPX has now climbed more than 22% from its Dec. 24 low, and is just about 60 points away from its all-time high close posted last September. The small-cap Russell 2000 (RUT) index, which had spooked some investors in late March by starting to slide under pressure from its wide exposure to banks, is up more than 3% from its March 21 low. Transports were among the best-performing sub-sectors Monday, with the Dow Jones Transportation Average ($DJT) up more than 2%. All the major airline companies enjoyed big gains, as did railroad company CSX (CSX). It might seem hard to believe, but just a month ago we were here talking about transports having their longest streak of losses in years. The end of that streak ironically coincided with the Boeing (BA) crash in Africa, and transports are up more than 5% since then. It’s often said that the stock market, especially transports and small-caps, is a leading indicator. That makes the current rally a bit more interesting, especially in light of what looks like a slowing U.S. economy and expected weaker Q1 earnings. The takeaway might be that investors could be looking further down the road and seeing possible light at the end of the tunnel. Many analysts expect earnings to improve in later quarters this year, and the Fed forecasts 2.1% gross domestic product (GDP) growth in 2019, above analysts’ expectations for Q1 growth of only around 1.5%. In addition, growing hopes for a Fed rate cut might be playing into the market’s strong April start, with CME futures now predicting 60% chances of the Fed easing rates before the end of the year. You could also argue that hopes for a China resolution play a part in the market’s current optimistic tone, but it’s important not to get carried away. The talks are already going on longer than political leaders suggested they would, and issues like technology transfers aren’t easy to resolve. Some analysts say both countries need a trade deal to help their respective economies, but it’s unclear how far negotiators might be willing to move. With the SPX now only 2% below all-time highs recorded last September, and up more than 13% since the start of the year, investors might want to consider not going “all-in,” especially with the tariff situation still in flux. Not everything was a smooth ride Monday. Lyft (LYFT) shares had a bumpy second trading day after their initial public offering, falling more than 11% and down nearly 5% in premarket trade today. This could be another illustration that an exciting first day doesn’t necessarily mean second-day follow-through for an IPO. While there’s no way to know where the stock might go from here, it looks like a lot of people were waiting for an exciting IPO and got one. The question with LYFT or any popular IPO is whether the momentum can be sustained, especially with an company that’s already experienced a lot of growth before going public. We’ll have to wait and see. DRYING OFF AFTER DIP: Both the Dow Jones Transportation Average (candlestick) and the Russell 2000 small-cap index (purple line), both often seen as leading economic indicators, have mounted strong comebacks after sagging in early-to-mid-March. Data Source: FTSE Russell, S&P Dow Jones Indices. Chart source: The thinkorswim® platform from TD Ameritrade. For illustrative purposes only. Past performance does not guarantee future results. “Sino” Sectors: With positive China news dominating the headlines early Monday, it seemed likely that some of the sectors with more exposure across the Pacific would potentially benefit. That’s exactly the way it played out, with Materials and Industrials leading the morning surge. Caterpillar (CAT) shares, which had been sagging most of the last month, got a 3.5% bump. Another sector that did especially well was Financials, which got beaten down a week ago amid interest rate fears. The Financial comeback coincided with a yield jump and strong U.S. data. Don’t discount the China effect for banks, either, because slowing world economies have arguably been another source of pressure on that sector. Any sign of progress in tariff talks would conceivably help not just the U.S. and Chinese economies, but also Europe—one of China’s biggest trading partners. A healthier global economy could be one of the Financial sector’s most bullish tailwinds. That said, some analysts wonder if the Financials might have suffered from slow trading volume in Q1, considering the relatively steady upward move in world stocks. More China Data On Tap: Looking ahead, there’s plenty of additional Chinese data on the calendar this month to consider watching. This is especially important in light of Monday’s action, when the U.S. and European stock markets both got a lift from better than expected Chinese manufacturing numbers. Some of the days when Chinese data might have an impact on the day’s action include export numbers on April 11, vehicle sales the same day, and, perhaps most importantly, gross domestic product for Q1 on Tuesday, April 16. As a reminder, China’s economy grew 6.4% year-over-year in Q4, the lowest growth rate for China since the financial crisis of 2009. For all of 2018, China’s economy grew 6.6%, the weakest pace since 1990. It’s the slowing Chinese economy that might be behind a lot of the interest rate concerns right now, so this data could have an even bigger impact than usual. Some investors might be checking to see if Beijing’s recent stimulus helped spark economic growth, but keep in mind that it’s unclear how quickly that can move such a huge economy. Sometimes economic stimulus in the U.S. has taken over a year to really show any impact. Cap Still on Capex? Turning back to U.S. data, today’s durable goods report for February just came out, and investors might want to probe it for any signs of a rebound in capital spending by corporations. Arguably, strong capex might be a bit of a surprise, considering that many companies have seemed to prefer to wait on the sidelines until there’s more signs of progress on U.S./China talks. The government shutdown might also have been a factor in weaker capex over the last few months. Basically, companies don’t tend to like uncertainty, especially about things they can’t control like tariffs and government spending. A smooth end to the tariff situation might be what many executives feel they need to put spending decisions back on the table, especially with the economy showing signs of slowing. Stay tuned for earnings calls this quarter, which could be a chance to get some color from executives on capex planning and what might drive those decisions.